One Day Courses Starting at 10.00am., you will spend the day within a small group on the course, and have three flights with one of our instructors taking turns to fly. The first flight will familiarise you with the thrill of a winch launch, and the sensation of silent flight followed by the landing. 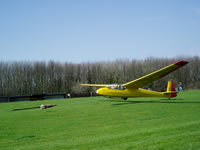 This is followed by two more flights taken in turn with the others, during all these flights you will be given the opportunity to take the controls of the Glider. We also encourage you to participate in other activities on the Airfield. Flight times are solely dependent on the weather conditions but should be between 7-15 minutes, and the overall duration of the course depends on how many others are on the Airfield.